Iranian state TV showed eight British sailors blindfolded and seated on the ground Tuesday, as Tehran said it would prosecute them for illegally entering Iran's territorial waters. Earlier, the men had been shown sitting silently on chairs and a sofa. 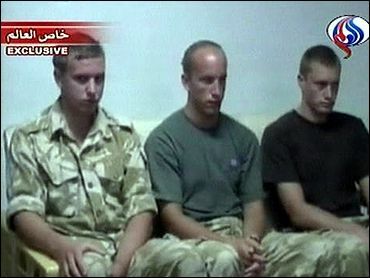 Three were in British military uniform; five others wore military trousers and civilian T-shirts. "They will be prosecuted for illegally entering Iranian territorial waters," Al-Alam television said. "The vessels were 1,000 meters inside Iranian territorial waters. The crew have also confessed to having entered Iranian waters," the broadcast said. The distance is about a half-mile. "Even if they have strayed into Iranian water technically by a few yards, in one sense, so what?" said British Conservative Party foreign policy spokesman Gary Streeter. The British government said the men were on a "routine mission" in the Shatt-al-Arab waterway that separates Iran and Iraq along their southern border. The Foreign Office summoned Iranian Ambassador Morteza Sarmadi to demand an explanation for the naval officers' arrest. "The ambassador was asked to explain why the eight are being held, for their release as soon as possible and for full consular access to them meanwhile," a Foreign Office spokesman said told the BBC. The BBC reports the two men have a good personal relationship after numerous meetings in the past. With the June 30 handover of sovereignty to an Iraqi government approaching, some analysts are saying that this is simply Iran asserting its control over the Shatt-al-Arab waterway, which has been a cause of many conflicts between Iran and Iraq, reporter Ramita Navai in Tehran told CBS Radio News. "It was actually a catalyst of the eight-year Iran-Iraq war."